Content marketing requires strategy and discipline for successful results. I recommend creating a strategic plan and schedule for execution. 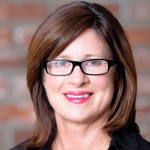 For success in content marketing, you need to be strategic and disciplined. Understanding your audience, how to leverage your services and products, and how to execute content are key factors. As with all marketing, first you need to understand your audience. What are their needs, wants, behaviors and attitudes? Can you walk in their shoes? (A great way to get to this is to craft marketing personas for each audience type you want to reach – see my blog on how to do this, Why Marketing Personas Rule.) On what social media and other online platforms are your audiences? If you’ve chosen the right audiences, they want and need your products or services. Now it’s time to put out content that educates and explains why they need what you have and how to use it if it’s a new product or service. If your product or service isn’t new, case studies and success stories can help your audience understand why you’re different and get a vision of what results they may get as your customer or client. Other content can be less utilitarian and more fun, contributing to your brand awareness (and perhaps going viral). If you are in a competitive market, you need to know what strategy your competition has (topics, places, frequency) and the amount of mind share they have earned. This will give you important information from which you can develop your content marketing strategy and frequency, so that you can compete effectively and perhaps differentiate from your competitors. When it comes to your schedule, it’s important to be practical. Quality of content and consistency are the most important factors in setting up your schedule. (One of the failures many of us have observed in content marketing are marketers who believed that quantity trumped quality, and they slapped together fluffy blog posts with little substance and no value and other content in an attempt to drive traffic to their site.) Quality content will attract followers and lead to engagement online. Consistency will keep them engaged, build brand awareness, and – if done right – help convert them to buyers. I blogged about the importance of being consistent with content in my post, Finding Your Blog Voice. It helps to set up structure to your content marketing schedule, and don’t deviate from your plan. 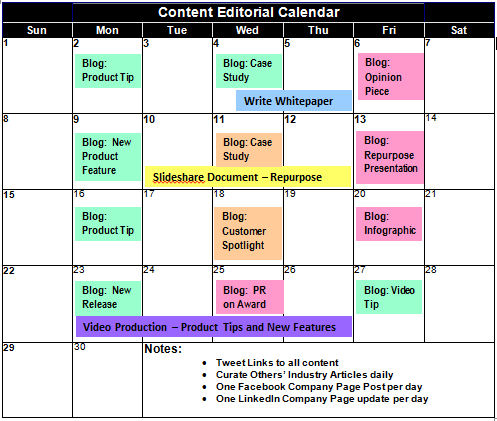 Use an editorial calendar and color code the types of blogs and other content you will create. Calendar due dates and try to adhere to them. If you need support creating and executing your content marketing program, contact New Incite today. We work with businesses to create and post custom content online that increases website traffic and qualified lead generation.